Yes! You Should Buy Now! I am not one of those Realtors that is always gung ho on the market telling you now is always the best time to buy regardless of what is going on. If I feel that pricing will continue to decline, I will tell you that. I may encourage you to buy, but I will make sure that we negotiate your purchase price to where the market is going. I now feel that today, right now, is the most perfect time to buy that I have seen in years. 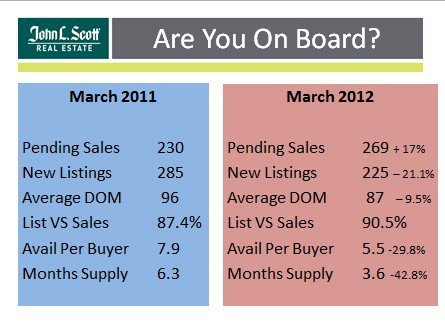 Here is why: For March 2012 (this was also true for February) we are seeing pending sales increase 17%, inventories decrease by 21%, the days on market time has decreased by 10%, the list vs. sales price has gone up 3%, the number of homes available to a buyer has declined by 29.8% (that is huge) and the months supply of homes for the lower end has decreased a whopping 42.8% from 7.6 month's supply to 3.6 month's supply (huge again). I am a numbers person and those numbers tell a story. So should you buy? In the words of Napoleon Dynamite " Heck, yeah!" The lower end market, under $250,000 is very fast right now. For the first time in years I am experiencing multiple offers, homes going quickly and buyers missing out that didn't position themselves correctly when writing an offer. Buyers and Sellers always seem to use laser like focus to hone in on that $2500 at the tail end of the purchase price. We have $250,000 or $200,000 that we are working with and they act like that last $2000 is what their offer is all about. It isn't. They really need to step back and see that as a buyer if they really like the property, it is in good condition, good location and that it will give them many years of enjoyment, why would you walk away from it when you can borrow that $2000 at under 4% and for $9 a month you can live where you want to live? I realize for investors and rental properties the numbers need to be where they need to be to fit your investment formula, but for an owner occupied home, take a wide perspective. You can't even buy a pizza for $9. Just saying. And for the sellers that refuse to come down that additional $2000 on their price to a qualified and willing buyer, what are you thinking? Even if you can make 6% return on that 2000, it would take you 25 years to make $3000 off it on straight interest. Never, ever, ever in this market or even in a great market leave several hundred thousand dollars sitting on the table in the hopes of making under $5,000. It is not smart and it is not worth it so that you can feel smug at dinner parties telling your friends how you squeezed that last $2000 out of someone. Instead tell the story of what a fair deal everyone got and how great you and the buyers felt and what a wonderful transaction it was. Oh, and how happy you are to move forward with your lives rather than being in the group of sellers that still have not got the memo and are lingering on the market year after year. It is a much more joyful story and people like joy. Last few points on why this is a perfect time to buy. When the lower end starts moving like it is and we are seeing more investors and cash buyers coming into the market, which we are, we know that the middle range will follow this trend. So get going, call me, call your Realtor, get your check book and let's get into the real estate market.